The love affair began when Freya saw the Rapunzel dress in Asda, it was purple, so the girl had to have it. The sleeves are organza, crazy really as she had accidentally ripped a sleeve off within days. A whole hour spent stitching it back together... I will never get that time back you know. Next step, I downloaded the original brothers Grimm story on my 'electric book' as Freya calls my Kindle. As is usual with fairy tales before Disney gets hold of them, it is a bit dark with people getting their eyes put out and so forth. Then she got the Barbie doll with stupidly knotty long hair, which I seem to spend most nights brushing before she comes down and trashes it again next morning. Finally, she has seen 'Tangled' the Disney version... many times I may add. Aunty Emily kindly got it for her third birthday. She has fallen in love with Flynn Rider and says his name many times throughout the day. We eventually bought Freya a Flynn Rider doll that now travels around with us and Prince Phillip, Edies main squeeze. 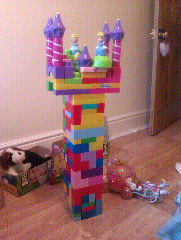 I am really proud of this last picture, my megablok masterpiece... Rapunzel's tower. Every megablok we had in the house and a spare twenty minutes, very therapeutic, like crocheting really.